visit when I was a kid. 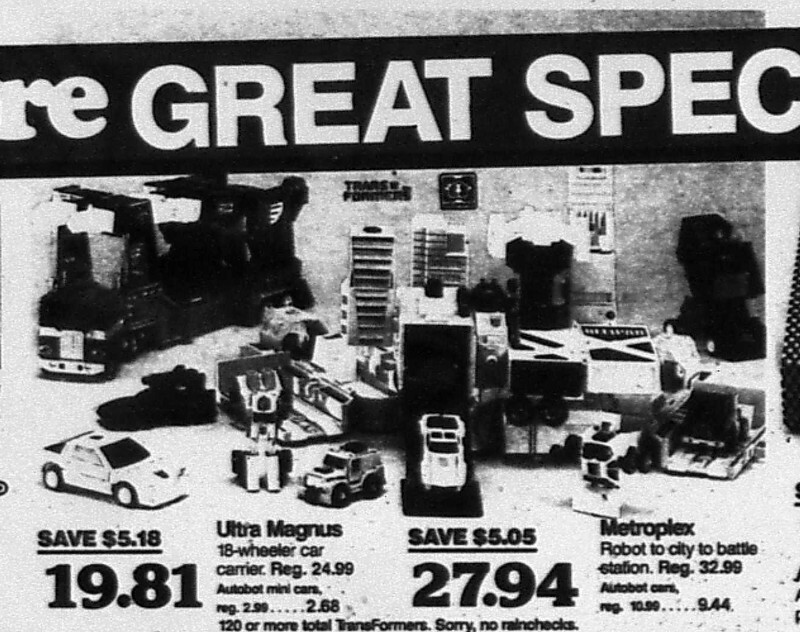 And it is doubly fantastic awful when I find out a certain store I never knew existed regularly ran amazing Sunday circular ads during the Toy Robots Wars of the 1980s. 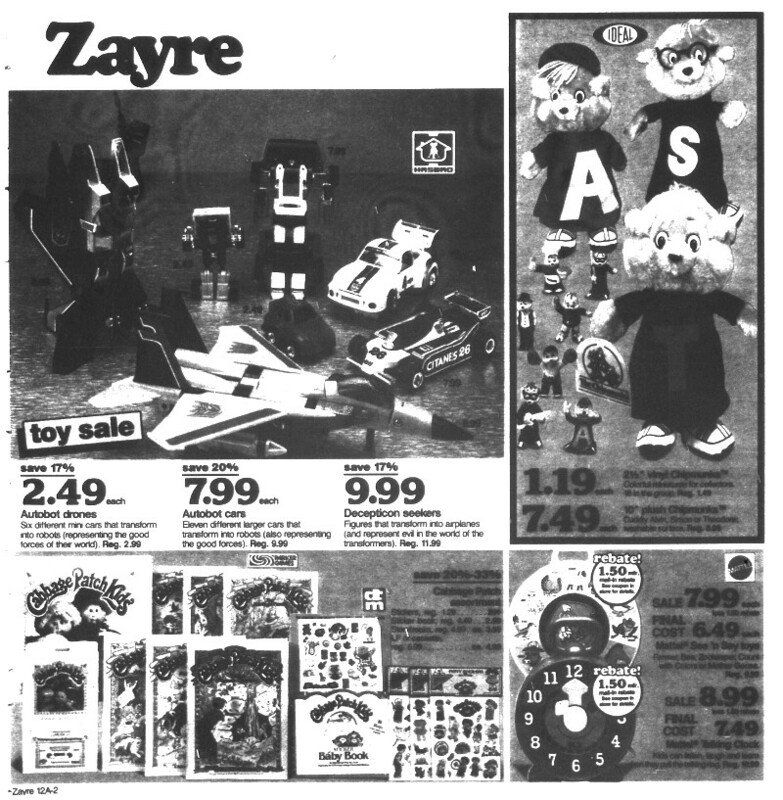 Well that's exactly the case with the long gone retail chain Zayre-a store whose ads were wonderlands of MotoBots, Diakrons, TransMobots, RoboForce, GoBots, and of course TransFormers. 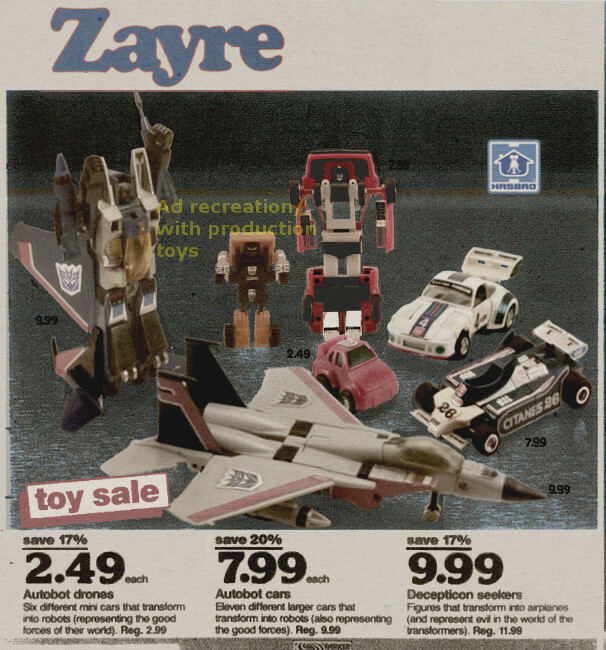 In fact, Zayre's TransFormer ads are legendary (to me) for many reasons, all of which will take a good forty five minutes of me driving back and forth to the library while recording in my van to explain. 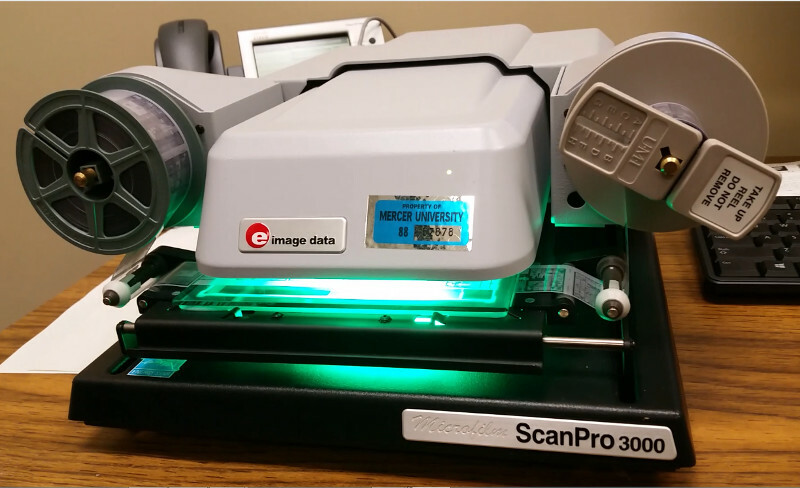 What is the secret source of the Zayre toy photographer's prototype action figures? What does a time machine set for April 29, 1984 sound like? How much spaghetti did you have to eat before Devastator had lunch with you? I don't know the answers but I got some ideas in this THE NEXT BEST THING TO BEING ZAYRE episode of the podcastalypse! 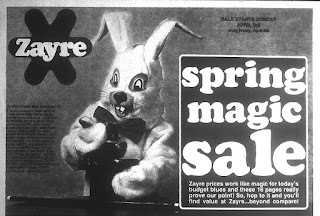 Zayre may be gone but it left behind a treasure trove of TransFormer ad mysteries. One of the things I like about trying to colorize the old ads I collect is that I find out new things about them I'd previously overlooked. It happened with a Target Devastator giftset ad and it happened again here with Zayre. A problem arose when I was trying to get the proportions of my Starscream photograph to line up with the one in the legendary April 29, 1984 Zayre ad that I first talked at length about in episode 50. 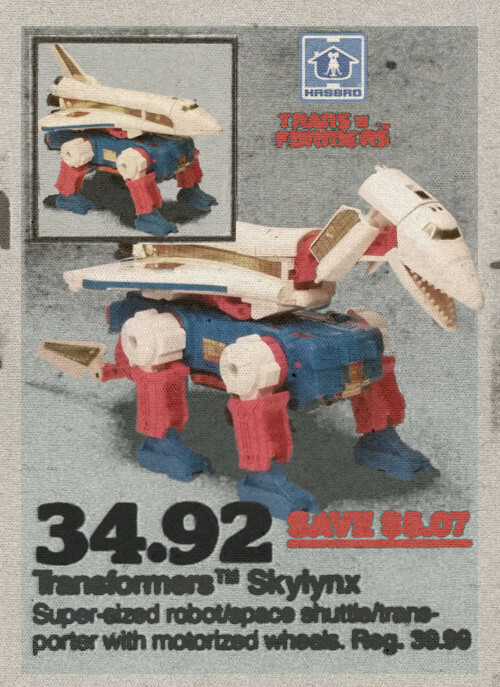 For some reason, no matter what angle I took Starscream's picture from, the right wing wouldn't line up correctly to match the proportions of the one in the ad! That's when I noticed the tip portion of the wing forward of the arm joint in the ad photoshoot Starscream extended just a little bit longer than the same part on my childhood Starscream. From what I understand this variation is a vestige of the ad toy's origins as an actual Diaclone F-15 Jetrobo. 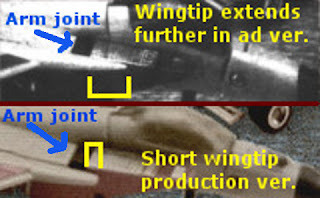 That mold had these elongated wings and a few other differences from the actual production toy. They really aren't the mass retail versions at all, but Japanese release toys with Transformer stickers on them Hasbro slapped together for promotional photography. These Diaclones with Transformer stickers were used in early catalogs including Hasbro's '84 Toy Fair book and the pack in toy checklist that came with the original first few waves of Transformers. To realize I was seeing a dressed up Diaclone in a Zayre Sunday circular surprised me. But I guess the ad was prepared so relatively early in the line's release that Zayre may not have had any retail samples available to photograph so they had to arrange something with Hasbro I guess. That's just speculation on my part. I don't know how they ended up with these particular toys in their ad. 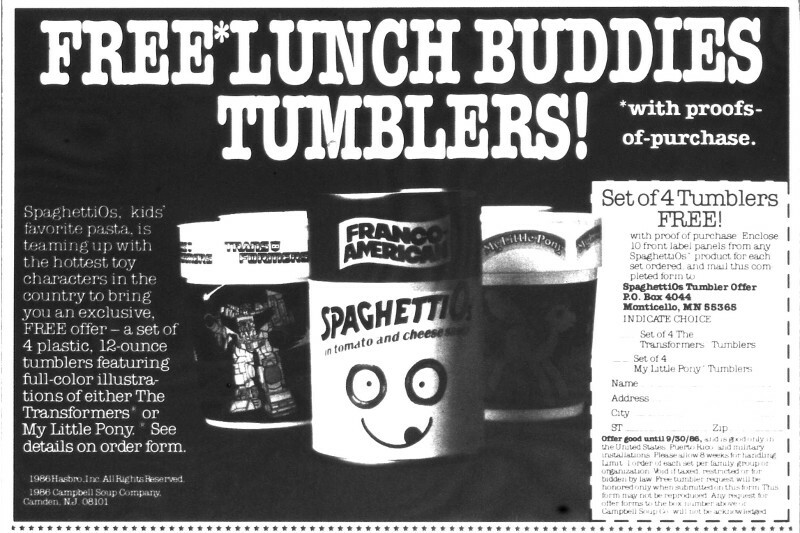 Here's the May 11, 1986 SpaghettiOs ad I was talking about. I never heard of those cups before so I was excited. Equally exciting was finding out that Zayre once got Victor Caroli to do a voiceover in their commercials! 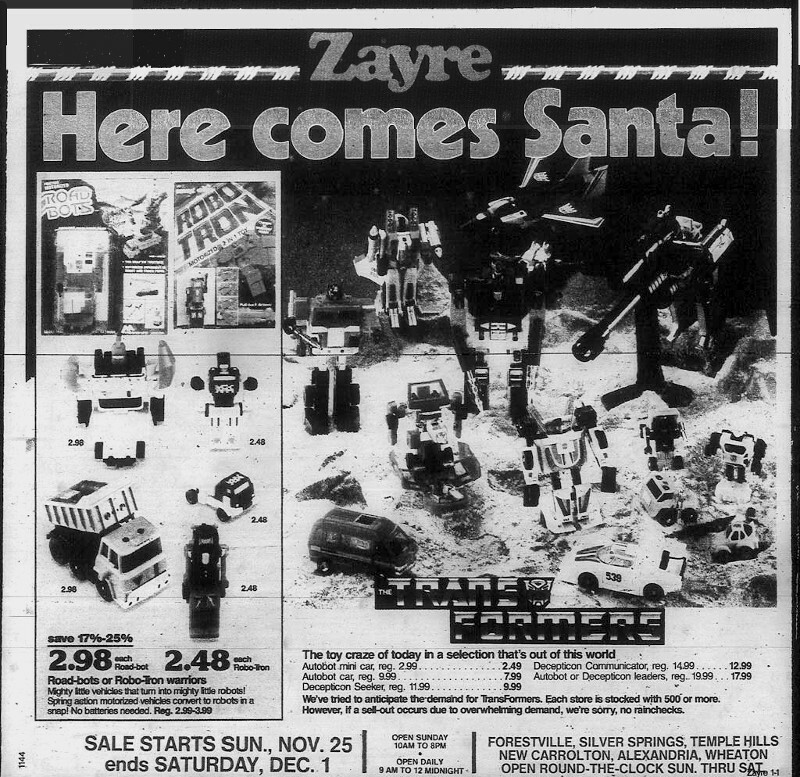 The November 15, 1984 ad up left is one of the few times robots (TransFormers in particular) dominated the front page of Zayre's circular. Note the yellow Cliffjumpers. The March 10, 1985 page up right shows how Zayre would give equal time to robot lines in their ads, even if some of the also rans weren't as popular as the big lines. 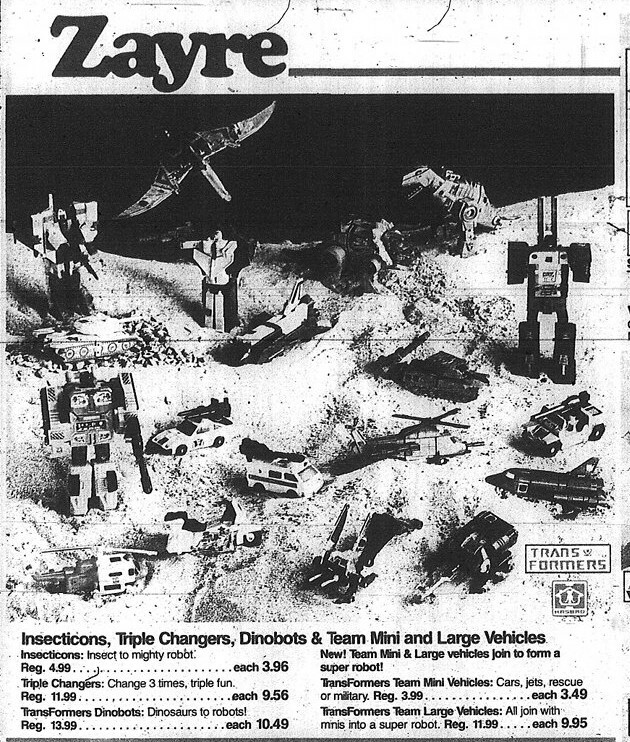 November 30 1985 up left was the only other time Transformers got on the front page of the Zayre circular. The February 16, 1986 ad up right features a rarity in TransFormers ads-Special Team leaders not wearing their super robot helmets! The Ultra Magnus cab in this June 8, 1986 ad confounds me so! It's obviously not white as a normal production version Magnus' would be. Is it just a red Optimus Prime cab? Is it a blue Powered Convoy cab? How did Zayre even get this particular trailer/cab combination in their photoshoot? 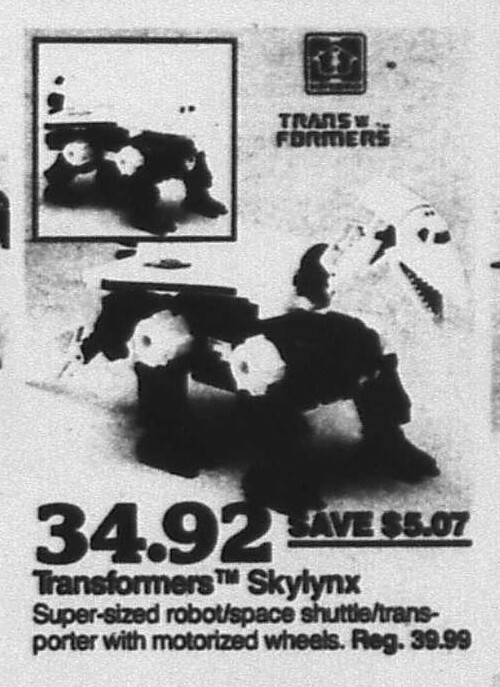 Sky Lynx is sad he was mistransformed so badly in his Zayre ad debut. This ad also marks the end of Zayre spelling 'TransFormers' with a capital F, which they had done from the beginning. I like to call this one 'Wreck-Gar's Bad Day'. It has the highest Decepticon-to-Autobot ratio of any ad I've ever seen! It's the return of Ultra Magnus to Zayre ads and this time he's got the correct color cab. This begs the question of what happened the first time and where does Zayre get the toys for their photoshoots if they're not the same ones every time? Zayre's record of correctly transforming the Scramble City leaders goes out the window with Silverbolt wearing Superion's head here. Speaking of transforms. 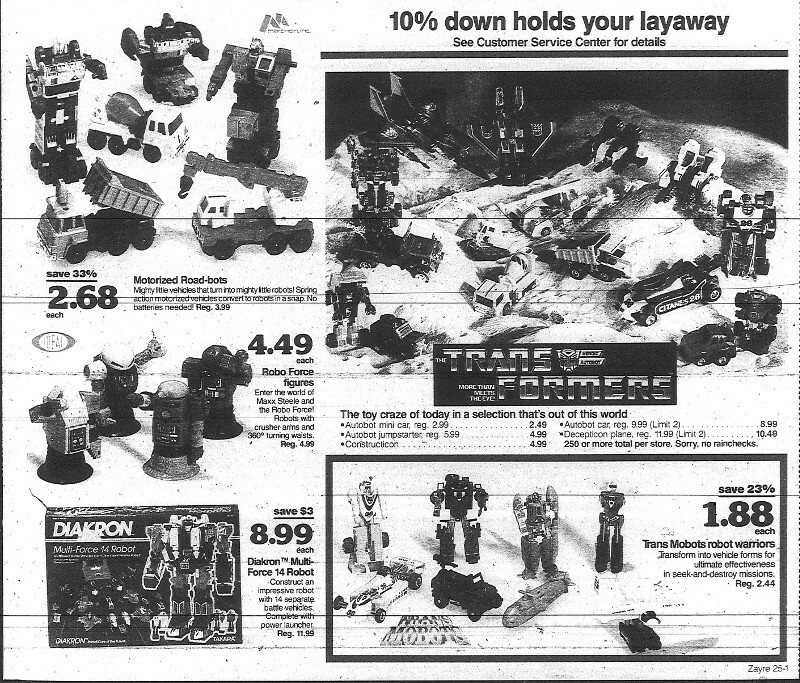 Metroplex and Ultra Magnus never appeared as robots in Zayre ads, despite the photographer trying to represent both modes for every other assortment. 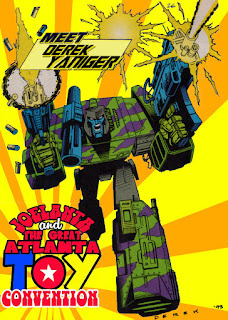 Trypticon is mentioned in this one but not shown. These '86 Zayre ads were marvels of composition considering how many elements the photographer had to cram in to each shot. What at first seems like a mistransformation is probably just the photographer trying to keep the toys representative while still not blocking out or getting in the way of anything near or behind them. Sky Lynx's alternate mode is correctly transformed here but offset in a separate graphic. I am noticing a trend where they didn't include doubles of the higher price point toys alongside themselves for display in both modes in the same physical space. It may have been a cost issue, who knows? Background stars are appropriate as this is the last of the great Zayre Transformer smorgasbords. 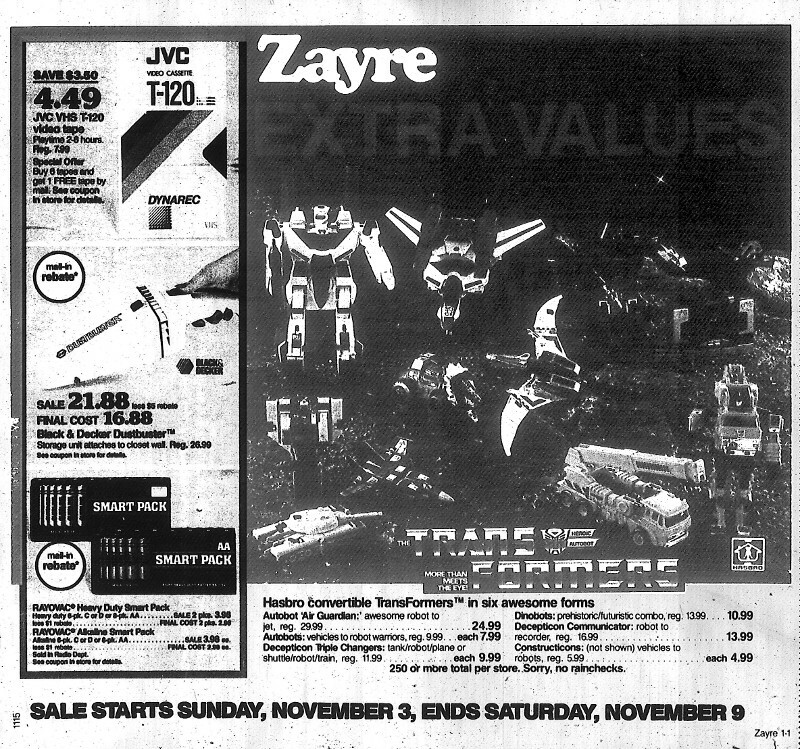 After 1986 Zayre just did not devote as much space or background rocks to their Transformer ads. At least in the end Metroplex did finally get to have his tallest tower attached in a Zayre ad after having to have them all removed or repositioned to get everything to fit during the previous photoshoots. We Care A Lot about TransFormers because you know why! A new episode? It's a 2017 miracle! ;) Can't wait to listen.